Home Collections 8 Piece Cleaning Set In PVC Bag Just $13.49 Down From $59.99! Ships FREE! You are here: Home / Great Deals / Home Collections 8 Piece Cleaning Set In PVC Bag Just $13.49 Down From $59.99! Ships FREE! GearXS has this Home Collections 8 Piece Cleaning Set In PVC Bag on sale for $13.49 (Reg. $59.99) when you use promo GXS-TIDY + FREE shipping! Now you can with this Home Collections 8 Piece Cleaning Set that includes a squeegee, latex gloves, heavy duty scrubbing brush, cleaning brush, palm brush, & dust pan & brush. Now doing the chores will be as easy as pie. 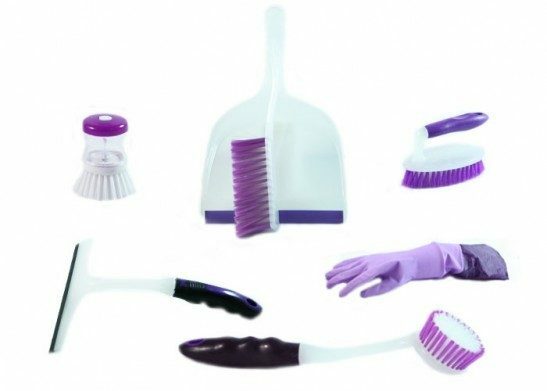 The cleaning set comes in three colors: purple, blue and red.